This post is part of Jewels of Elul which celebrates the Jewish tradition to dedicate the 29 days of the month of Elul to growth and discovery in preparation for the coming high holy days. This year the program is benefiting Beit T’shuvah, a residential addiction treatment center in Los Angeles. You can subscribe on Jewels of Elul to receive inspirational reflections from public figures each day of the month. You dont have to be on the blog tour to write a blog post on The Art of Beginning… Again. We invite everyone to post this month (August 11th – September 8th) with Jewels of Elul to grow and learn. This is the age of perpetual beta. New features, tools and applications are being developed at such a rapid pace, that it’s more efficient to adopt a rapid & agile approach to development and implementation than to try to perfect it before going live. You might notice that Gmail and Flickr are still noted as “beta”. Today things move quickly, and being agile and nimble is more important than being perfect. The consequence, however, is that without a defined end point or beginning, we might forget to pause and reflect, or to fully embrace a new beginning. When we’re constantly evolving, and continually focused on what’s next, do we lose the opportunity to get the most out of this moment, and what we’ve accomplished? It’s always hard to carve out the time for reflection, but every time I do it, I am reminded that it’s worth its weight in gold. Looking backwards in an age of constant innovation might seem counter-intuitive, but it is critical for future success, happiness and improvement. This is true whether it’s a new release of some widget or gadget, or a birthday, or Rosh Hashanah. The cycle of the Jewish year is important not only for giving us reason to stop and reflect, but also for giving us a reference point for that reflection. I often remember my thoughts, feelings, regrets, hopes and thankfulness of last year, or the year before at Rosh Hashanah. The intensity of the holidays, the unique feeling of walking into the synagogue on that day, and even the words and tunes of the prayers evoke those memories that were etched into my being a year, or two, or three ago. The power of the day is not in what I’m thinking or feel at that moment, but how much has changed over time. I once read a book, Managing Transitions, about how organizations and people navigate change. The take-home message for me was that change is situational, like a light switch. You close a factory, you require your staff to use a new database system, or the calendar tips from 5770 to 5771. But transition is psychological, and is a process. If we only see the change, and don’t engage in the transition, has anything really changed? If we are truly going to embark on a new beginning, we must take the time to close one chapter before we can transition into the next phase. I’ve always been fascinated by the word “beginning”. Seemingly a noun, the “ing” gives it this little boost of a verb’s energy. Maybe it’s just a noun in perpetual beta. There’s a good thing cooking on September 15th. It’s the third annual Women Who Tech summit, a series of phone-based panels featuring the who’s who of women in technology, includingRashmi Sinha of SlideShare, Kaliya Hamlin of Shes Geeky, Shireen Mitchell of Digital Sistas, Beth Kanter, Amy Sample Ward, Michelle Murrain, and Lauren Vargas,, Irene Au of Google, Amy Jo Kim of ShuffleBrain, Heather Harde of Tech Crunch, and Lynne d. Johnson, formerly of Fast Company and now with the Advertising Research Foundation (plus a couple smart men, such as Clay Shirky and Geoff Livingston). The event is a series of stellar panels (again, by phone, so you can participate from anywhere), including “Social Media ROI”, “Launching Your Own Startup”, and “Self Promotion: Is This Really a Rant About Gender?”. I totally get the premise of the summit, that women are underrepresented in mainstream media and blogs and conference panels, that we need to break down barriers to women’s participation in the technology sector, and the need to create a network of women in technology who can be called upon as experts in their field. As the Wall Street Journal reports, “only about 11% of U.S. firms with venture-capital backing in 2009 had current or former female CEOs or female founders, according to data from Dow Jones VentureSource. The prestigious start-up incubator Y Combinator has had just 14 female founders among the 208 firms it has funded.” Women Who Tech is not the only women-focused event on the calendar. In December, the influential technology conference TED is holding its first women-focused conference. (More stats and resources about women in tech are available here.) I applaud these events, not for their sometimes interpreted as “affirmative action for women” approach, but for their celebration and encouragement of women who are breaking down perceived (as well as actual) barriers. The thing is, I grew up in a different world, where my CEO-of-educational-technology-startups mother worked long hours to excel at her career, make the world a better place, and be a 100% mom at the same time. It’s possible that she worked harder than her male colleagues, or had more to balance with her roles at home, but from my point of view as a kid and young adult, women could do anything. The fact that I have chosen to work in a tech-related field isn’t because I am trying to change percentages, or represent my gender in high level decision making. It’s because it excites me, and I’m good at it. Gender never played into my decision (if it had, I would be doing something else? ), and it rarely presents itself as an issue in my professional life. That being said, there are definitely times when I look around the room and find myself in the company of mostly men. I like to think I’m rather Zen about it. I take note, and then move on. Recently, I’ve been putting together a panel for a social media session at a major national Jewish conference. I’m struggling to find a man for the panel, you know, just for the sake of diversity. So in my world, thankfully, the experience is not as one-sided as the venture capital statistics seem to say. (Note to self: I wonder how different is actually is in the nonprofit world – reflecting on my experiences at NTEN conferences, the presenters are heavily weighted towards women. Currently seeking the latest stats). The goal here is not 50/50 equality all the time. The goal is to recognize both real and perceived barriers, and to abolish them. While others may interpret events like the upcoming Women Who Tech and TEDWomen as equally sexist as the venture capitalists whose decision making percentages they quote, I think the greatest power of these events is to give women who didn’t have moms like mine a similar sense of “anything is possible.” Further, as women, we do face unique challenges (as me sometime about the weeks leading up to announcing to my clients that I was pregnant for the first time, or how I paced around the house with a newborn in a sling, the wireless phone clipped to my hip, and a headset on – someone should have taken a photo). But most of all, these events are tremendous for one main reason: they showcase tremendous talent, all in one place. The Women Who Summit event is an easy-to-swallow $20. Really. So mark your calendar for September 15th, from 11am to 6pm Eastern time. All you need is an internet connection and a phone line. Check out the schedule and register online. There are even after parties in a handful of major cities. I might try and get myself to the New York City one. Anyone care to join me? Plus, I’ve got 2 passes to give away. Leave your comment here with your thoughts on gender and technology and I’ll pick two winners before Rosh Hashanah (September 8th). But go ahead and buy your pass now. You can always give it to the nice gal (or guy) down the hall. With a pink bow around it. Or not. Data Is The New Soil. What Are You Growing? Posted on August 23, 2010 by Author Lisa Colton Leave a comment on Data Is The New Soil. What Are You Growing? It is no surprise that we’re increasing inundated with data. The amount of information collected and recorded is unprecendented. The question is: what will we do with it, and what value does it have. In for-profit business, the data about online purchases, demographics, or reasons for calls to a customer service line help a company be more effective, efficient, and ultimately profitable. As I’ve worked with many Jewish organizations, I’ve learned that few are tracking data in useful ways, and even fewer are using this data to improve their programs, communication or allocation of resources. Data collection and analysis goes far beyond what funders may ask for in grant reporting, and productive data usage requires first and foremost that you’re asking the right questions. In this TED video, David McCandless shows the power of data visualization. While the raw data may be overwhelming and not particularly useful, visualizing data may bring important patterns and relationships to light, and laying data sets on top of one another (frequency and geography, for example) can uncover important stories that otherwise would have been invisible. This “knowledge compression”, as he calls it, makes data useful. For those of us not yet collecting much data at all, these new ways of looking at the data may inspire us to start! A new phenomenon has taken over the social media airwaves these last few days. Out of the blue, least expected, it’s the Old Spice Guy. I don’t watch much TV, so I missed the TV ads earlier this year where Old Spice introduced actor Isaiah Mustafa (“the man your man could smell like”). With a serious voice and a towel wrapped around his waist, the Old Spice Guy has responded to questions and comments received through Twitter, Facebook and Reddit via 30 second YouTube videos. Haven’t seen them? Entertain yourself on their branded YouTube channel (which opens with the original commercial if you haven’t seen it). Throughout the short and intense blitz, Old Spice had uploaded over 180 videos for its campaign, which have generated over 5.9 million views and 22,500 comments. (Source: Network World). The campaign is fascinating for its viral success. This chart from Visible Measures shows it’s relative success compared with President Obama’s victory speech, the video of President Bush’s dodging of a thrown shoe, and Susan Boyle’s surprising vocal performance on TV, all major viral hits. The secret? While Old Spice Guy responded to regular folks (Johannes S. Beals tweeted a request for a marriage proposal to his girlfriend), he also focused many of his responses to questions posed by sports stars, celebrities and major publications. For example the online tech site Gizmodo asked via Twitter, “will anything surpass the loofah as the predominant body wash-applying technology?” The response was this. And of course, Gizmodo posted the response video on its website and other channels, amplifying the views even more. The first key lesson here is about connecting with your audience personally. While Old Spice is only responding to a relatively small number of questions, Mustafa is speaking directly to individuals, seemingly person to person, rather than logo to consumer. There’s a big difference. Second is knowing how to use your influencers. Isaiahs first videos responded to bloggers and journalists that had written about the Old Spice commercials. He then moved to celebrities, and chose random individuals whose questions or comments would make for great entertainment (like the marriage proposal). By responding to people (and companies) with large audiences, Old Spice is able to leverage their brands to exponentially increase their own success. And when the campaign starts to get viral, everyone wins. Gizmodo, for example, is thrilled to have gotten a video response (and a few million people may have just learned about Gizmodo for the first time), and Old Spice is thrilled Gizmodo posted is on their own site (reaching millions of their readers). It’s a win-win for all. Third, make it fun! If people are enjoying engaging in your campaign (tweeting, sharing, talking about at Starbucks or at the gym), it will intensify. Whether you’re selling Old Spice or trying to get people to come to Jewish Trivia Night (my favorite tweet comes from @SixthandI Synagogue: “Test your knowledge to the tune of ‘Let’s get quizzical…quizzical’ I see you dancing 80’s style in your cubicle,” followed by a link to their event. Rick Bakas gives a good overview of why this social media marketing campaign is so effective including a reminder to have fun. ReadWriteWeb shares the inside scoop on how marketing firm Wieden Kennedy created and executed the campaign, including all night filming sessions in Portland, OR, where they averaged 7 min of production for each 30 second response. FastCompany interviews the team that orchestrated the campaign. And a guy from Reddit asked for the audio to create an Old Spice Guy voicemail message. He responded with many audio options to create the message. Now you can have your own. http://www.oldspicevoicemail.com . While the 2 day blitz of video responses may have ended this morning, it’s fascinating to see how others have picked up the ball and run with it. How are you empowering and energizing your community to support your mission and goals? While the Old Spice campaign may seem leagues away from nonprofit endeavors, the lessons learned from this success surely apply. Use your influencers. Make it personal. And remember to have fun. The “New Normal” is Change. Deal With It. Posted on May 6, 2010 by Author Lisa Colton Leave a comment on The “New Normal” is Change. Deal With It. At the Jewish Communal Service Association’s annual program today, change was the name of the game. Jerry Silverman, CEO of Jewish Federations of North America in particular spoke about two kinds of change that we need to embrace: First, accepting that constant change is the “new normal” (the theme of the JCSA conference), and second, the need to confidently lead through change, whether that be changing economic times, new technologies, and evolving cultures. On the first, we need to learn how to be more nimble — learning new skills, evolving our decision making processes to be able to move more swiftly, and being able to adjust structures to keep the machine humming when the outside world shifts. But all of this is only possible when we are successful with the second. Leading through change is a great challenge, that involves not only good business strategy, but excellent communication, team building, listening, and attention to the psychology of change, not only the logistics of change. If the Jewish community needs one thing, it’s people who are superb leaders in times of change. Several years ago, when Darim was shifting from our original work of building web sites to a focus on training, coaching and consulting, I read a powerful book, Managing Transitions, by William Bridges. The take home message: Change is situational (like a light switch), but transition is psychological (a process). We need leaders who know what change needs to be made to thrive in the “new normal”, but those same leaders also need to facilitate a transition, which requires a whole different set of skills. Switch, by Chip and Dan Heath (from Amazon.com): In a compelling, story-driven narrative, the Heaths bring together decades of counterintuitive research in psychology, sociology, and other fields to shed new light on how we can effect transformative change. Switch shows that successful changes follow a pattern, a pattern you can use to make the changes that matter to you, whether your interest is in changing the world or changing your waistline. The Power of Pull, by John Hagel III, John Seely Brown, Lang Davison (from Amazon.com): In a radical break with the past, information now flows like water, and we must learn how to tap into its stream. But many of us remain stuck in old practicespractices that could undermine us as we search for success and meaning. Drawing on pioneering research, The Power of Pull shows how to apply its principles to unlock the hidden potential of individuals and organizations, and how to use it as a force for social change and the development of creative talent. Open Leadership, by Charlene Li (co-author of Groundswell) (from Amazon.com): “Be Open, Be Transparent, Be Authentic” are the current leadership mantras-but companies often push back. Business is premised on the concept of control and yet the new world order demands openness-leaders do not know how to be open and be in control. This must-have resource will help the modern leader understand how to lead in the new open world-where blogging, twittering, facebooking, and digging are becoming the norm. the author lays out the steps that leaders must take to transform their organizations and themselves into being “open” -and exactly what that will mean. Empowered, by Josh Bernoff (co-author of Groundswell) (from Amazon.com): Fueled by data from Forrester Research, Empowered is packed with the business tools and information necessary to move your organization several steps ahead … and lead … your people (who are) armed with cheap, accessible technology, and are connecting with customers and building innovative new solutions. What are your strategies for managing change? Where have you been successful? What’s hard? Do you have advice or other resources to add to the conversation? Onward! 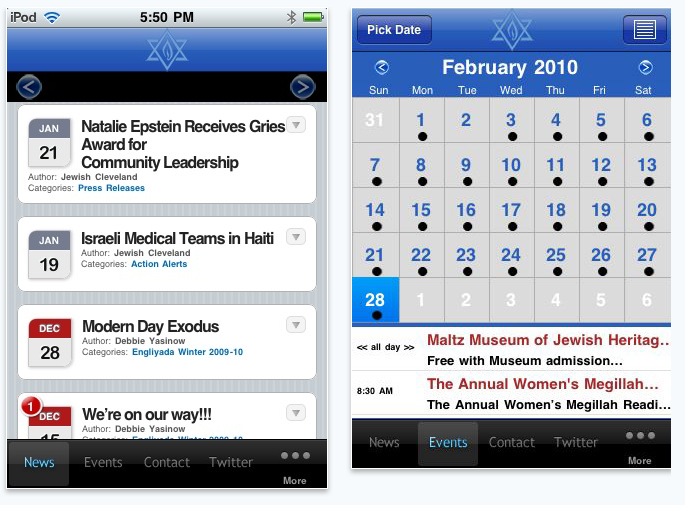 Turns out Birthright Israel NEXT isnt the only Jewish organization with an iPhone app. In addition to BRI NEXTs Mila4Phone, there are hundreds of other Jewish apps available through the iTunes store. Some of them are Torah related, others are related to Shabbat, prayer, Kashruth, or learning. One organization that is leading this trend in the Jewish community is the Jewish Community Federation of Cleveland. Its app, Jewish CLE, features a community calendar, interactive maps, a community director and links to the Federations YouTube channel, twitter feed and event photos. JewPoint0 caught up Steph Dlugon, director product marketing of iNomadics, creator of Jewish CLE, to learn more about how the app came together. How did Jewish CLE come to be? About a year ago, iNomadics had this idea about creating apps for places like nonprofits, and community and arts organizations. Because nonprofits always have events or time sensitive information that they need to get out to their constituents, we felt they needed to develop a mobile presence. We approached the Jewish Federation of Cleveland with the idea of developing an app. The Cleveland Federation thought it was a good idea and we started working with the people there to figure out what their needs would be and to develop the best features. A year ago was early on for nonprofit organizations to be thinking about the mobile web. One of our challenges was to find a forward-thinking group that saw the benefit of a tool like this. Even though it took some time to hash out the details, initial talks with the Cleveland Federation were really promising. They seemed to get the idea, the benefits and usefulness of having an app right away. Whats so important about a mobile presence? I think about the Internet of the 90s, when everyone scrambled to have a website. That same trend is happening now with going mobile, and its happening much faster than in the past. Its important for organizations, if they want to stay viable, to adopt a complete mobile strategy. And the ones that do will be able to stay relevant and thrive. What was it like working with the Cleveland Federations leadership? We had talks with different groups within the organization throughout the whole process. Because the app was a pretty new idea, we had a bit of a challenge trying to explain its benefits to different groups in the organization. If we ever got stuck, we would regroup and bring in other people to help make it work… If there is one lesson learned its the importance of open communication from the beginning so that everyone understands what is happening. What is Jewish CLE all about? There are a couple layers to it. First is the news feature, which just gets information to people, and that is why I think its being downloaded all over the world. Second is the events piece, which has events from entire Jewish community, not just Federation events. That is an engagement piece that is really important. A lot of organizations in the community can benefit from the app, which should help to bridge all gaps in community. Another piece to the app is the call to action stuff. Were trying to direct people to different ways to get involved. Not just directing people to the Federation to donate. We are helping people learn more about the Federation, which helps to connect people and get them on the same page. If the end result is information or donations either way to us its awesome. How are you evaluating or tracking the impact of the app? There is not really a formal evaluation process on our end. Im sure the Cleveland Federation is tracking usage and downloads. We are looking for feedback from users from the Federation on how to improve it. But, measurement and evaluation is an interesting concept. Consider: do we look for ways to justify the printing of calendar, or of owning a phone system? No, that is just the basics of running a business. We have to get past the question of should we or shouldnt we? to the question of should we do it this way or that way? So, readers: Have you downloaded the CLE app? Thoughts? This way or that way? 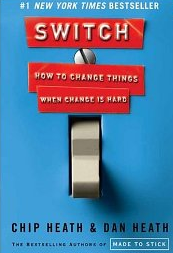 I am currently re-reading Switch: How to change things when change is hard by Chip Heath & Dan Heath. Amongst the many dog-eared, and underlined sections is a brief line on page 17: What looks like resistance is often a lack of clarity. The authors example is a public health campaign in West Virginia that specifically directed residents to switch their milk drinking from whole to 1% or skim. Instead of the valuable but diffuse and difficult goal of simply acting healthier, the campaign gave clear instructions. What can this mean for non-profits? Quite a bit. At a recent fundraising auction checkout, one of our cashiers requested an additional donation to support the work of the beneficiary. Her line had a smaller than 5% donation rate. Our other checkout line asked winning bidders to round up their purchase by 2, 5, 10, or 18 dollars (whatever brought them to the nearest $100 figure). This money would go to purchase a new pick up truck to be used by members. This second line had a 37% round up rate. For a small non-profit that was the difference between $10 dollars in the first line and $475 in the second. Neither was enough to buy a pickup, but with clear instructions the actual dollars in the bank increased by 40 times. What about you? How specific are you with your asks? Do you tie gifts to specific programs, ask for discrete amounts at particular times, or take advantage of triggers in the environment of your supporters? Follow your bright spots. If a campaign, donor, or programming is exceeding your goals, try to determine why and replicate it. Marry long term goals with short term critical moves. Your mission is critical, but showing your staff and supporters how you will get there shrinks the change, and energizes giving. Script the moves. For an organization that fights homelessness, linking a monthly gift to equal to 1% of a donors mortgage payments can keep your mission front of mind and the amount and timing of donation clear. Grow your people. Increase their role and identity within your organization. Donors who support a public health campaign might become messengers with their donation receipt you can arm them with support materials and task them to teach 10 friends the importance of breast self exams. Act more like a coach and less like a scorekeeper. Everything looks like a failure in the middle. Focus on the valleys of a program as learning opportunities rather than failures. There should be no never only not yet. Use the score when it can help you. The herd mentality can work for you. If the majority of your board members have exceeded last years gift, use that fact. People tend to fall in line with their peers. What is your favorite take home from Switch? winwinapps is a VT-based, internet toolkit that takes the hassle out of running a nonprofit, freeing you up to do the work that really matters. We help you. You help them. That’s a winwin. 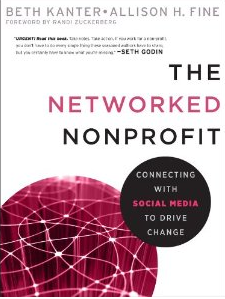 One of the best sessions I attended was where Beth Kanter and Allison Fine (among the gurus of nonprofit technology) presented their upcoming book, The Networked Nonprofit (due out in June, but you can preorder here). These two women completely understand the future of nonprofit organizations in the digital age, and I could listen to their wisdom, humor and case studies for days. One element from their presentation keeps knocking around in my head, the idea of three stages of organizational development in this networked era. Transparent – an organization that fully engages and empowers their community to accomplished shared goals. I love the simplicity of these three stages, and the acknowledgment that getting on social media platforms is not the ultimate goal. Plenty of people are promoting events on Facebook and measuring success by the number of tushes in the seats. But the real paths to accomplishing our mission and goals, and the more accurate measurements of success go far beyond this. They also require a leap of faith, and the ability to take that first leap. Remember the first time you climbed to the top of a high dive as a kid, your heart beating so hard you thought it would leap out of your chest, and that moment when you finally hurled yourself into the air? It’s the same moment really. And remember when you went back again and again and again to do it over and over? Yeah, it’s like that too. So tell us — what stage are you at? What do you need to move from one stage to the next? Where do you see examples of “transparent” organizations or activities?